The Alabama men's basketball team have traveled to Tuscon, Arizona for their first true road game of the season vs the Arizona Wildcats. The Wildcats were a preseason top five team, but early struggles forced them out of the top 25. Following a road win at UNLV and a semi-home court victory over Texas A&M, Arizona appears to be rebounding. More good news for the Wildcats: injured guard Rawle Alkins, who has yet to play this season, is expected to return in some capacity for this game. His return only adds to the overwhelming challenge facing Alabama as they prepare for a team that rarely loses at the McKale Center. Game time is 9 P.M. CT. It will be televised on ESPN2. Click the links for team and Pomeroy stats. My Two Cents: It hasn't been easy, or pretty to watch at times, but Alabama sits at 7-2 entering this game. They've been able to overcome lapses on defense, inconsistent rebounding, a lack of ball security and terrible free throw shooting to grind out most of their victories. In order to win this one though, the performances we've seen up to this point simply won't cut it. If Alabama turns the ball over 20+ times, or fails to convert their free throw opportunities, the likelihood of a competitive game, even against an Arizona team with its own share of issues, will be minimal. Players to Watch: Braxton Key will be a game-time decision tonight, but I don't expect him to return until the Mercer game, based on comments made by Avery in his last press conference. Nevertheless, he did travel with the team so it will be something to watch. 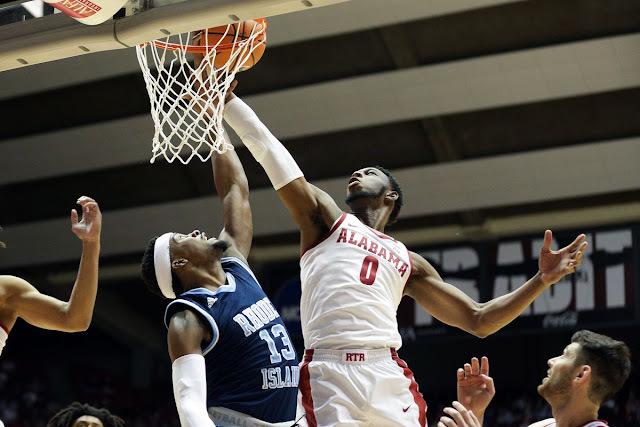 Daniel Giddens played his best game in an Alabama uniform against Rhode Island. The sophomore big man finished with 12 points, 6 boards, 2 blocks, and most importantly, 2 fouls. Switching to a smaller line-up and bringing Daniel off the bench has helped him avoid early foul trouble, which has allowed him to have a greater impact on the game. Arizona has one of the best 1-2 punches in college basketball in Alonzo Trier and DeAndre Ayton. Trier, a junior, is averaging 22.0 ppg, 3.4 rpg, 2.6 apg. He's already scored 25+ in five games so far this season. Ayton hasn't just been one of the best freshmen in college basketball this season, he's been one of the best players period. A potential top-3 draft pick in June if he decides to enter, Ayton is averaging 19.6 ppg, 11.2 rpg, 1.7 apg, and 1.3 bpg. The only knock against Ayton so far is he has a tendency to drift out to the 3-point line. He can make the shot, but his 26% mark from 3 suggests that he should spend more time dominating in the paint. For our guys to have any shot to win this game, they must limit Ayton and Trier, and live with someone else having to beat them.